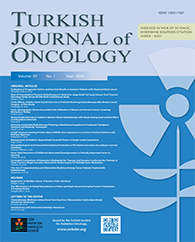 Hypofractionated Preoperative Chemoradiotherapy In Locally Advanced Rectal Cancer: Preliminary Results. Determining Unmet Needs Among Breast Cancer Survivors - An Exploratory Sequential Mixed Methods Study. Evaluation of Emotional and Behavioral Problems in School-Age Children of Patients with Breast Cancer. Late Radiation Outcomes of Patients with Newly Diagnosed Glioblastoma Treated with Accelerated Hyperfractionated Radiotherapy and Temozolomide. Dosimetric Accuracy of an HDR Brachytherapy Treatment Planning System for Different Irradiation Lengths with Monte Carlo Simulation. The Prognostic Significance of Complete Response Rates in Patients with Extensive Stage Small Cell Lung Cancer. A Case of Epithelial-Myoepithelial Carcinoma in the Nasal Cavity Treated with Definitive Chemoradiotherapy. Rare Occurrence of Synovial Sarcoma Originating from Dura Mater.